Noel Jantzie served for five years on the executive of a large urban teachers’ convention association. Over his career he presented a number of times at teachers’ conventions and specialist councils on topics including: Social Studies, Educational Technology, Environmental Education, and Educational Policy. We all have great curriculum linked resources that we know teachers would love, if only we could get the face time with them to show it off! Teachers Conventions are a great opportunity. All public teachers (including those working for Catholic separate school districts) in Alberta are required to attend two days of Teachers’ Convention during February and March. There are 10 conventions in Alberta. Most of the work in planning the convention is done by volunteers who are also classroom teachers or school administrators. They have limited time to accomplish tasks that usually fall to full-time event planners in other professions. This means that the easier you make their job, the more likely you will be successful in applying for and delivering a session at a convention. Here are some tips to help you through the process. Most Teacher Conventions begin to select sessions and build their programs in the late spring. Conventions often have more applications to give sessions than can be accommodated in convention venues. An application that misses a deadline is an easy one to reject and requires little work on the program chair or program committee’s part. Make sure that your application is on time. The convention association will have a specific format for the submission of your application. You may be required to submit online to a database with severe restrictions on the number of words available to describe your session. You need to provide sufficient information to sell your session, while remaining within the space restrictions specified by the program committee. Not following the specifications for submission is another opportunity for the program committee to make an easy decision not to approve your session. Don’t let this happen to you, follow the rules, and take the time to write an engaging description of your session. Be sure to make the tie between the material in your session, and the appropriate year, subject, and curriculum topic from the program of studies. Tight linkage with the curriculum will make it more likely that your proposal will be approved, that teachers will attend, and that evaluations will be positive. A clear statement on how this session will help attendees present specific curricular content to their students is more likely to prompt teachers to go to your session. While tight curriculum linkage is great, it may also restrict the number of teachers who will show up at your session. Be sure to look at other subjects than science in order to expand the population of teachers who may consider your session. New programs in Career and Technology Studies and curriculum change in Social Studies at the high school level have opened up opportunities for cross curricular connections. As many elementary teachers are generalists and teach most, if not all, subjects you will find the pool of potential attendees much larger for sessions with elementary curricular tie ins. No matter how good you think your 60 slide PowerPoint presentation is, chances are that by slide 30 your audience will want to be somewhere else (and those at the back of the room may well begin to take action on this impulse). Workshops engage people in learning and give them a chance to test out instructional materials and classroom activities. Even if your session is really not workshop suitable, you need to build in as much audience participation or hands-on activities as possible. Keep PowerPoint slides to the minimum and choose short video clips to illustrate your point over static slides. Pre-packaged classroom materials are very popular inducements for teachers to attend a session. Note how often a teacher will drop in just before or just after the session “to pick up the handout” before heading off to some other presenter. While we may have our suspicions about how many of those handouts actually make their way into classroom use, as opposed to the filing cabinet, as presenters we still need to meet the need of teachers for physical memorabilia. On the other hand, as an environmental educator (and responsible human being), you probably have a deep seated aversion to killing trees in order to generate this material. There is a way to avoid this conflict by mailing out material electronically, or by allowing teachers to download copies of the material to a personal USB drive. Keep paper handouts to a minimum and make sure that every handout has contact information (email, URL, and social media). Circulate an email sign-up sheet and follow up with a material package as soon as you can. Tell people in your session description that material will be made available to attendees in a digital form. While on the surface, a teachers’ convention may appear to be a one-off event, remember that they occur every year and that the organizing committees share information. 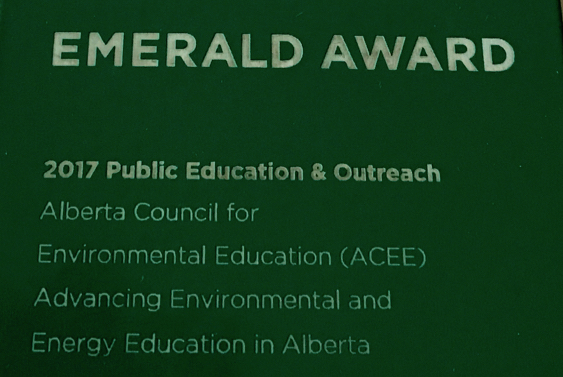 Evaluations of speakers and sessions are compiled by the Alberta Teachers’ Association (ATA) and are shared between committees at meetings during the year. Making contacts and meeting people at the convention is an important way to network with professional development providers across the province. Knowing who the program chair is (and even better having them know who you are) is an advantage when making contact for next year’s convention application. Evaluations are shared with other convention committees and with the professional development staff of the ATA. You will often be able to get a copy of the raw evaluation forms, or a summary of the results, from the convention association. A good evaluation is important if you intend to regularly present material to the convention circuit, so do pay heed to what the teachers attending your session have to say. Once you have finished your presentation, your work is not complete. If you have created a mailing list of session attendees, make sure that you send out promised material. If you have permission to continue contact through the year make sure to ask if they have had any problems with the material or if they have any suggestions on how to improve it. Make sure that you maintain contact with the convention committee and any hosts or volunteers that you have spent time with. Positions change in the convention committee, so your host from this year, may be the program chair next year. This will also allow you to find out when the deadlines are for subsequent applications, and if there is a special focus to the convention. Although conventions are important professional development events that engage almost every teacher in the province, they are not the only professional development activity that you should participate in. Alberta teachers are also encouraged by the ATA to join a subject specialist council . Each specialist council holds an annual conference so you should also apply to the relevant specialist councils to present at these conferences. Presenting at these events will build your profile amongst decision-makers on convention committees, (a convention committee I served on usually had three or four presidents of specialist councils as members of the committee and these individuals were extremely influential in the choice of program sessions). The more people who know about your organization and your sessions, the more easily you will gain access to teachers’ conventions and other professional development venues.